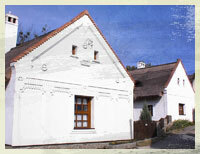 We await our kind guests in the historical ancient village of Tihany in romantic and evocative cottages. There is a fine view from over the abbey of Tihany to the tip of the Hungarian sea. The apartments are completely separated, furthermore each one has its own entrance. The apartments equipped with every comfort, cable TV and with gas central heating provide relaxation to the guests both in the winter and summer-period. The houses built of natural materials reflect the folk-architecture style of the region. The reception area resembles a village museum, the three cottages in the yard look like a "skansen". The several hundred years old, half a meter thick stone walls and the 30 centimetres -thick thatched roof guarantees an excellent climate for the apartments. At the outdoor grill our guests can make use of their gastronomic skills. The table and benches in the garden are a perfect place to eat the food you have made.